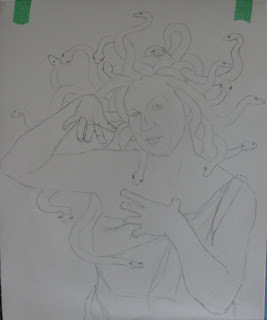 No pictures today, but will take one later of the revisions I have already decided to make to Medusa. I allowed my husband to see the original drawing and told him I was thinking of changing the expression in her face. He agreed that she was not mean or surprised enough looking. We also agreed that the upraised hand was too relaxed and needed more tension, maybe even a different position. I had Jennifer come back into the studio for a few more poses and photos. I think she is very good at getting the expression or poses I am searching for and we now have a winner. I laid tracing paper over my original drawing and changed the face and hand only on the tracing paper. Today I will place transfer paper under the drawing and get the parts I still like onto the canvas and then do the same with the revisions. 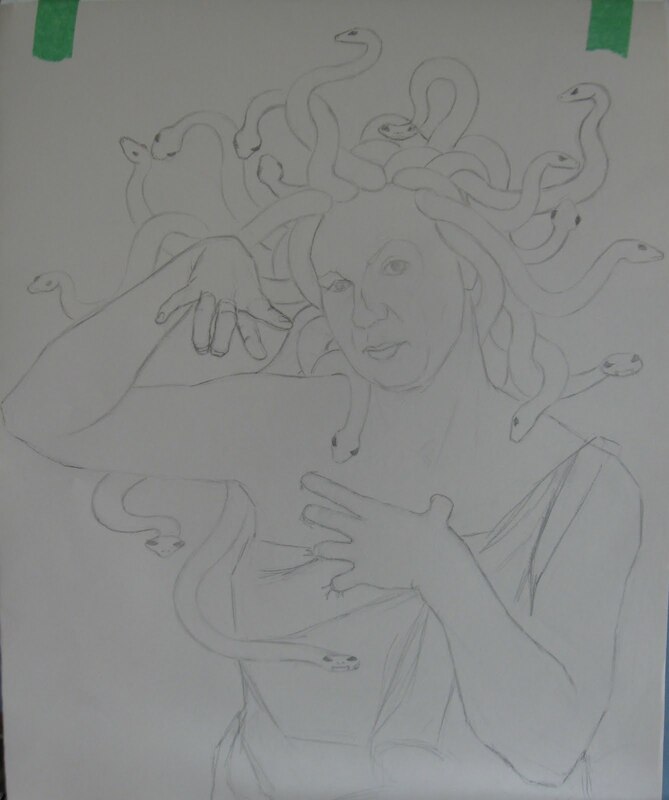 Tomorrow I will post a photo of the revised Medusa. When I first started seriously learning to paint in the late 1990s, I painted still life. The objects did not move on me and my kitchen was filled with subject matter. As my confidence grew, I branched out into animals, but from photos. Again, I needed my subjects to stay still for long periods of time. I bought books at every opportunity and copied from them to educate myself. From time to time I tried my hand at landscapes. I found that although I like landscape art, I don't like bugs and wind and the constant change of the sunlight. But I continued landscape painting, by visiting the site, snapping lot of pictures and making a few sketchs and color studies. All from the comfort of the car or a shady spot to sit. I progressed to painting portraits, my first true love. What a challenge, to not only create a beautiful painting, but to also get a likeness. I now find that when doing a portrait, I am really excited about the objects in the painting along with the person. HMMMMM Still Life? It appears my art education has come full circle. I am currently working on a series of still life paintings in a simple format, with dark backgrounds and a common element in each. This is the latest in the group of grape paintings with the kitchen hand towel. I have five completed and hope to do another five this summer. OK, I know this is hard to see, but here we go anyway. Dear Sweet Jennifer, the model for Venus, has agreed to be Medusa also. That is a real stretch for her and you can see by my layout drawing that she does not look very mean. In all of the reference photos I took of her, not one of them has a contorted enough expression to suit my taste or concept of this next painting. I think I will call her back into the studio and work on getting the expression more surprised and mean looking. Now that I am looking at it on the computer, I am thinking I want the raised hand in a different gesture. I also noticed that the lowered arm is a bit awkward and could use some attention. Speaking of attention, I am such an ADD HD personality and hate to waste a minute, always wanting to rush right into the details. In the past, I have usually done this first step on the canvas in the form of a grisaille. The next day what was put on the day before is usually dry and I am stuck with the drawing even if I want to change direction or concept. I am doing more work on paper ahead of time these days. Its another step, but eliminates a lot of changes down the road, if I think things out on paper first. This week I have reached two milestones......turned 59 and entered the world of the technogeek. I received a laptop computer from my husband with a birthday card inscribed with "I could not let you be the only student without a laptop". He was refering to the upcoming Illustration Master Class. Not required, but most artists are using them. I was really wanting one, secretly. And to make this the best birthday ever, my son and daughter in law gave me tickets to see "Wicked" at the Kennedy Center in DC. I may have finished Saint Alice this week. I will let the painting sit in a corner for a week or two and I will glance at it occasionally to see if something becomes obviously in need of correcting or tweaking. I revisited some reference photos of Diamante and his feet. Want to be sure they are accurately drawn. Some parts of the painting are a bit weak, I think, and a few days in the corner will help me see them better. 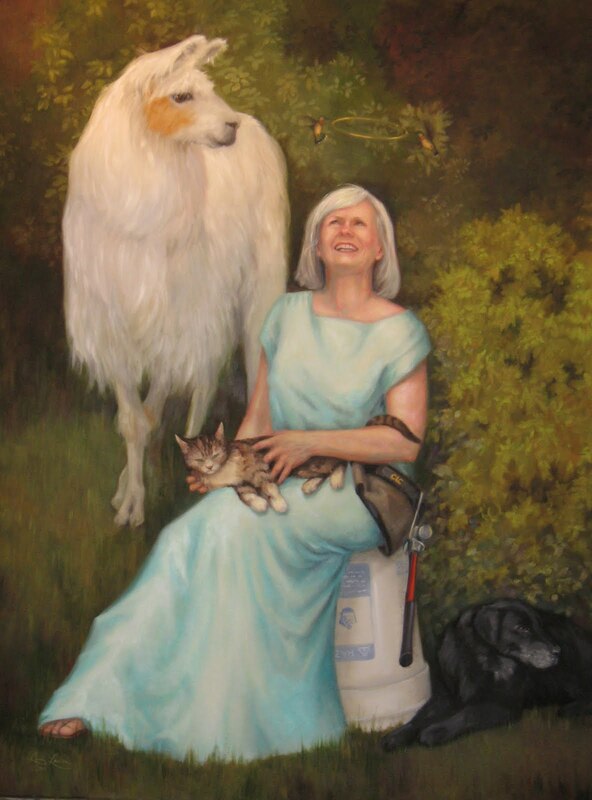 All in all, I love the light that falls across the Llama's head and onto Alice's face and then to the bush on the right. All artists constantly hear this phrase....."You should paint _____." We grow tired of this phrase from well meaning friends and family members,(my husband all the time), because as artists we want to paint or draw what we find inspiring or interesting. And so for all those years that my husband and his friends were doing living history, I was not interested and turned my nose up at doing historical art. 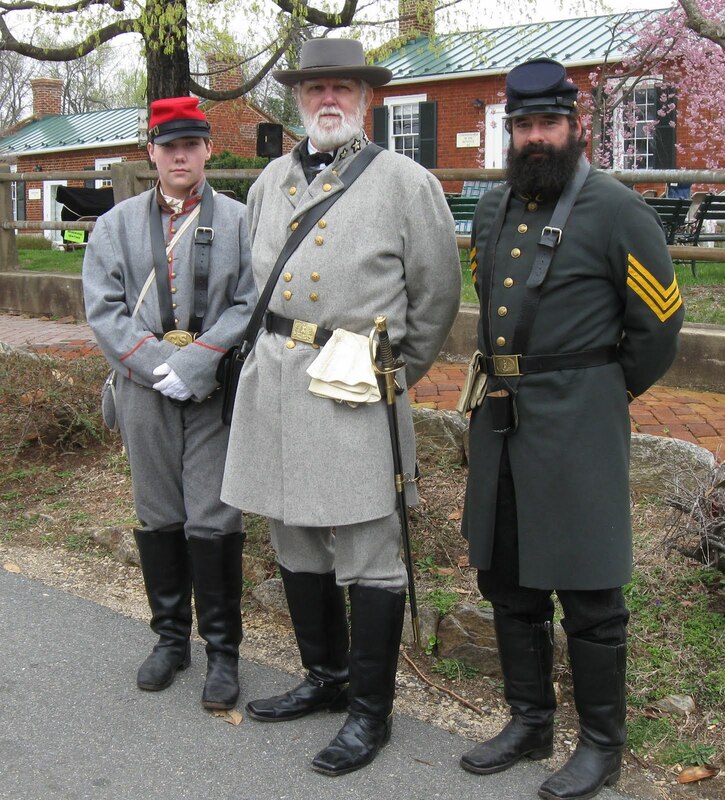 Then when I did become interested in this genre, my husband and his friends had long since given up the pasttime, gotten rid of most of their costumes and lost their contacts. And so, I had no reference material for a few ideas which were percolating in my brain. going off to war at the age of this young man? Many did! Thank You General Lee and friends! Linda Lawler is an artist working in a naturalist realism style. She works as an Illustrator and Portrait Artist. Ms Lawler is currently working from Western View Studio in Gore Virginia and teaches privately at the studio. Contact her for individualized instruction. Her works have garnered her many awards, most recently, the Elaine and James Hewitt Award for Oils & Acrylic at the Audubon Artists Show, held at the Salmagundi Club in Manhattan in Sept. 2015. The award was for her painting, Family Tree. All artwork on this site is for sale. Contact Linda at Western View Studio, e-mail her at lindalawler@outlook.com for pricing and to purchase.